The Golden Lamb is the oldest continuously operated inn in Ohio and its good food and large warm fires have comforted people for over 200 years. 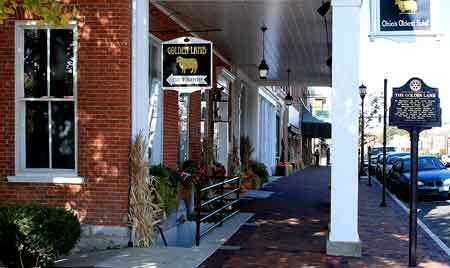 Located half way between Cincinnati and the National Road, the Golden Lamb was a natural stopping place for travelers. It became not only a magnet for locals but also for the famous. Twelve US Presidents have been served there as well as Charles Dickens and Mark Twain. Thousands of frontiersmen stopped to warm themselves and to take a drink sharing their adventures with all that would listen. 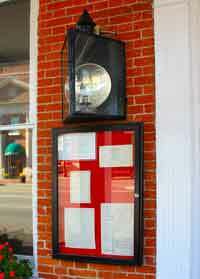 It all began on December 23, 1803 when Jonas Seamen entered the Warren County Court to apply for an Public Entertainment licence. The Court was then being held in the Black Horse Tavern and for the cost of $4.00 Jonas and his wife Martha began the journey that would take this gathering place through two centuries. The Golden Lamb began in a log cabin. The Golden Lamb name came from the Seamen's logo they first created. Since many of the pioneers traveling through the area could not read, it was important for a new business chose a name that could easily be associated with their enterprise such as the "Black Horse Tavern." So the Seamen's chose the "Golden Lamb" which could easily be recognized and differentiated from other animals. The original brick building built in 1815 was a 2 story structure located about where the lobby area and Dickens dining room currently stand. In 1844 a third story was added. And shortly after that a three story wing was added which is where the Shaker and Buckeye dining rooms currently stand. In 1878, a fourth story was added to accommodate the men working on the railroad that was passing through Lebanon. The gift shop and Black Horse Tavern were added to the structure in 1964. In 1926 Robert and Virginia Jones, married just 2 years, purchased the Golden Lamb. By then the old brick building, which had been renamed The Lebanon House, was in bad need of repair. It became a life-long labor of love for the Jones who would spend the next 40 plus years of their lives turning the inn into what we know today. The Golden Lamb is a true Inn and you may spend the night in rooms like the John Quincy Adams Room, Charles Dickens Room or the George W. Bush Room. The dinning experience is unique and the menu impressive. It is not often you can sleep in an inn so rich in the history of our country and then enjoy a world class dinning experience. The Golden Lamb is located near the center of Lebanon and is open daily 11 am until 9pm and Sundays 12am - 8pm. Be sure to visit the gift shop on the lower level.